Upon evaluating the situation, they coordinated with Major Vri’bek and quickly developed a plan. More stormtroopers were in the hanger bay with Desperate Measures. The major turned the ship’s blasters on them and while the troops in the spaceport were distracted by the murderous blaster fire coming from within the hanger bay, the crew opened fire on the stormtroopers. Between Desperate Measures and their blasters, they made short work of the Imperial troops. They boarded their ship and hauled jets, ignoring commands from the spaceport authorities to halt their illegal departure. As they achieved orbit, the attention of both star destroyers turned upon them, and the Imperials launched flights of TIE fighters to intercept the rebel ship. I apologize for the crudity of the model. I didn’t have time to build it to scale or paint it. The crew went to their battle stations. 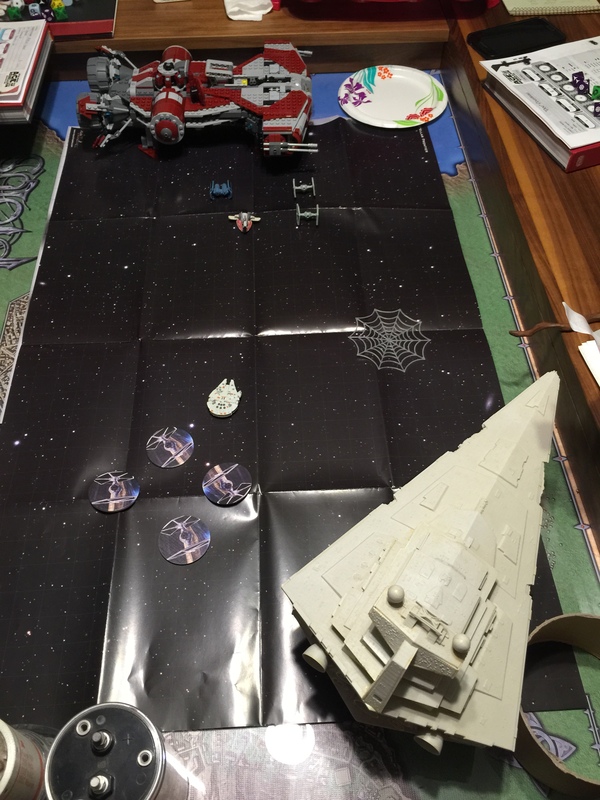 Ren flew the ship while Marcus and Lisska manned the guns. Doc made the calculations for the jump to hyperspace while Daesha managed the shields, sensors, and damage control with the help of Major Vri’bek. The closest flight of TIEs engaged Desperate Measures. The Imperials were no match for Ren’s piloting skill and the deadly accuracy of the ship’s gunners. The ship made the jump to hyperspace with minimal damage just as the second flight caught up to them. While in hyperspace, they conferred as to which freighter they would attack. They settled on the ship with the longest overall voyage; Blue Ronto. With the information provided by Dr. Tysho, they were able to determine a likely stopover for the freighter and decided to lay in wait in an obscure system through which the ship was passing and would have to drop out of hyperspace to delivery some cargo. Blue Ronto was unarmed and essentially defenseless against the rebel ship. Nevertheless, the crew bluffed the captain into letting them board under the guise of cargo inspectors. It was obvious he wasn’t entirely convinced, but Marcus convinced the human captain that cooperating was in their best interests, particularly since the Blue Ronto’s crew had no particular loyalty to the Empire. Once the kolto was secure about their ship, our heroes returned to the Listehol Listening Outpost and collected Dr. Jerol, then returned to Mirial. The remaining rakghouls had starved or froze to death, so the long task of cleaning up the base could begin…. Next session is the beginning of episode 5. I’d hoped to wrap things up in episode 6, before the Halloween session (Oct. 30th). There’s two game sessions left before then, so it’s possible, but we’ve been averaging an episode every session-and-a-half, so, I may need an extra session or two to properly wrap things up. I certainly don’t want to rush things; I have an epic conclusion planned. Upon arriving at Manaan, the crew of Desperate Measures immediately knew the mission would not be a blue milk run. Two Imperial Star Destroyers orbited the planet, the Retaliator and the Indomitable. Our heroes would have to tread carefully. Since the Empire had built a luxury resort in the capitol, Ahto City, the crew of Desperate Measures chose to land in a smaller city. Major Vri’bek elected to remain with the ship, partly to safeguard it and partly to keep it ready in case they needed to make a quick getaway. The crew split up; Marcus and Daesha scoped out seedy bars in the hopes of using the twi’lek’s underworld contacts while Ren, Lisska and Doc checked the hospitals and medical clinics. Ren, Lisska, and Doc learned that the Empire was cracking down on kolto distribution. The local facilities could get it, but only enough for their needs. No surplus was available for sale, despite the substance being considered grossly obsolete compared to bacta. Marcus and Daesha found several drug dealers. Eventually, they were able to convince a ranat called Rizzo that they really just wanted kolto and nothing as restricted as spice. He said he might know someone and wanted a 500 credit finder’s fee if said someone made contact. Later, when the group rendezvoused at their agreed-upon safehouse, they were approached by a yellow R4 unit, R4-NP4. The droid delivered a message from its master that the crew was to take the provided transport pass and travel to Sharla Deep Lab. There, they met a togruta scientist, Dr. Kaneer Tysho. He said he could help them acquire kolto, but it was too dangerous to smuggle it offworld with all the Imperial activity. He offered them the routes of three frieghters hauling kolto they could rob: Bantha Pryde en route to Corellia, Ancient Thrym en route to Coruscant, or Blue Ronto en route to Thyferra. He would give them their coordinates and schedules with conditions: they promised not to harm the crews, they promised the ships would be permitted to continue on their journeys once the necessary kolto was acquired, and they would get word to their Rebel Alliance superiors that Dr. Tysho and his staff wanted safe passage off of Manaan, preferably to some place far away from the conflict, like the Corporate Sector. Once terms had been agreed to, the crew returned to the surface. They discovered the Empire had redoubled its patrols and Daesha sliced her way into the controls of the submarine. Ren piloted it away from the transport hub and they surface near the spaceport, hoping to avoid Imperial scrutiny. Despite the Imperial presence in the spaceport, they all were able to sneak back into the city, except Daesha. She was discovered by an Imperial who offered to help her up. Doc tried to get her away from him but he didn’t seem to believe the mon calamari’s claim that they’d been swimming and fishing recreationally in the highly polluted waters around the city. Doc charged the Imperial, knocking him off the platform. He held the man under water until he expired. Unfortunately, the Empire was altered to their presence by this time and a firefight erupted. Daesha took the opportunity to disappear into the crowd, while Ren, Doc, Marcus, and Lisska dealt with the stormtroopers. The spaceport was now on high alert and they saw at least a squad of white-armored Imperials guarding the docking bay where Desperate Measures awaited…. This session continues from where session 2 left off: the PCs had just gotten settled in the Rebel Base on Mirial, received their new assignment, and the word came through: Alderaan was obliterated, destroyed by the Empire. Despite the atmosphere of shock and sorrow permeating the Rebel Base, our heroes had to press on. They had a job to do and despite the latest atrocity by the Empire, duty still called. Listehol was a neighboring system, so flying there to investigate the now-silent listening post would take a few hours at worst. Major Vri’bek had Desperate Measures loaded up with the gear they’d need and they were off! Navigating to Listehol was fairly simple and the listening post was at the provided coordinates. It seemed lifeless, though, and a fly-by showed the cause: an asteroid collision. They landed on the large landed pad on the outpost’s roof and suited up. With the power out, there was no safe way to get inside, so Lisska forced the turbolift doors and they climbed down. A quick glance around made it obvious what happened: some object collided with the Listening Post’s sensor array, causing an explosion which hurled shrapnel through the transparisteel viewports causing catastrophic depressurization the emergency system were not equipped to handle. All hands were lost. A quick survey revealed that only two transparisteel windows needed patches and then life support would function again. They made the necessary repairs and went into the utility level to reset the generators. Unfortunately, the sub-level was infested with mynocks. Using the generator’s diagnostic software, Daesha pinpointed the locations of the power drains. The others killed the mynocks attached to the power cables and also cleared them out of the sensor suite’s inner workings. Once repairs were complete, they returned to Mirial. Strangely, the base’s defenses seemed to be offline and there was no communication from the base upon approach. The hangers were empty, devoid of the shuttles and starfighters assigned to the base, yet there were no signs of hostile actions. Ren piloted Desperate Measures into the hanger bay and they saw a shape crouching over a body on the deck while a mechanic waved at them frantically from within the control room. Their ship drew the attention of the shape devouring the body and it looked up and snarled. It might once have been human, but now was clearly feral and bloodthirsty. Marcus fired the ship’s weapons at it, vaporizing it. They set down in the hanger bay, geared up, and entered the Rebel Base. They first checked in with the mechanic who had locked himself in the control room. Though the bith mechanic was hysterical, he reported that this wasn’t some sort of attack, but rather the creatures ravaging the base were former rebels! Some of the other officers and technicians were holed up in the med lab and our heroes established contact with Dr. Jerol and Major Vri’bek. Dr. Jerol was able to establish that every feral mutant was a wounded rebel who was treated with the bacta brought from Mother Ithor. Apparently, the bacta was contaminated with a dormant virus so old, it didn’t show up on modern sensors. In fact, the virus was thought to be extinct since no cases had been reported in over a thousand years. It was Dr. Jerol’s opinion that the bacta had been deliberately contaminated with Rakghoul Virus. Marcus and the others had a horrid revelation: they were allowed to escape from Mother Ithor in order to bring the contaminated bacta back to a rebel base. They fought their way to the medlab and retrieved Dr. Jerol, Major Vri’bek, and the technicians, then returned to the hanger and retrieved the technician from the control room. Due to the isolation nature of the Rebel base, Dr. Jerol was confident the remaining rakghouls would starve to death by the time they returned, and it was highly unlikely they would be able to scale the icy walls of the polar canyons in which the base was located, then trek across hundreds, if not thousands of mile of uninhabited arctic wilderness to civilization. Crammed into Desperate Measures, they returned to the Listehol Listening Post and planned their next move. Once everyone was settled in the Listening Post, Dr. Jerol informed the crew he believed he could synthesize a vaccine, but it would require a bacta substitute he could use to purge the system and purify the bacta. They would have to go to the Inner Rim system of Manaan and acquire several tanks of kolto, bacta’s precursor. Despite being outdated, kolto was still regulated by the Empire, and Manaan was, in fact, heavily patrolled. Major Vri’bek would accompany them while Dr. Jerol and the technicians remained at the Listening Post. Preparing to travel to the Empire-controlled, Inner Rim, the crew of Desperate Measures had their work cut out for them….